It looks like the race for President in Montana is a complete tossup. 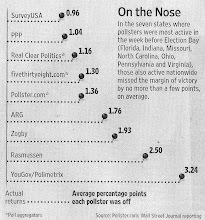 What's less clear is that it can be attributed to Ron Paul's spot on the ballot in the state. Paul is actually pulling equally from Democrats and Republicans- getting 2% of each of their votes- while polling at 9% with independents. Obama has the slightest of leads based on his standing with two key groups: independents and voters under 30. With the former he has a 48-40 advantage. With the latter he is up 54-41. Like in many states, the contest in Montana is going to come down to election day turnout. Among those who say they have already cast their ballots in the state, Barack Obama has built up a 61-35 lead. Among those planning to vote on Tuesday John McCain has a 53-40 advantage. The extent to which those folks follow through is likely to be the deciding factor in who takes the state. Oh wow. That was unexpected. WOW! Can Obama actually pull a win out of MT? What a night it will be tuesday! Can't wait for the results! So far early voting (as of 10/30)in Montana is at 40% of the total vote (early and day of) in the state from 2004. What about Florida Is that still happening soon? Or it could simply mean the race is close. But I dunno, tuesday just can't come soon enough. Who'd have thought we'd have an election where the Democrat is polling almost as well in MONTANA as Ohio?? ?